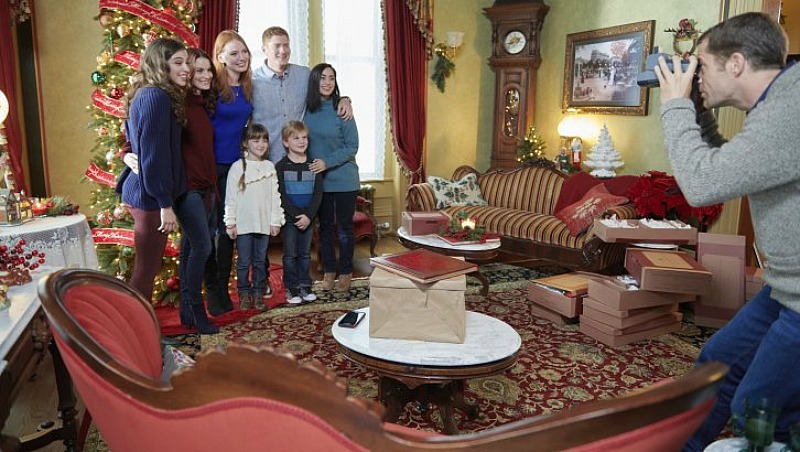 One of our family traditions is to start watching Hallmark Christmas movies together on Thanksgiving night, and we binge our way through as many as possible until the new year. Even my husband and son are willing to watch with us when we make it a game, creating our own BINGO boards to see who can spot as many of the typical plot twists in each movie as possible. 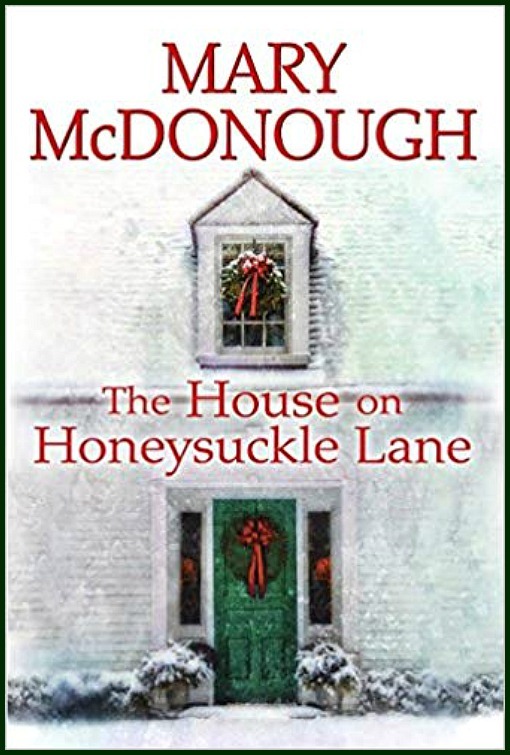 When we watched the 2018 premiere of Christmas on Honeysuckle Lane, I became almost too obsessed with the gorgeous old house to focus on my board, though. I had to know more about it. Keep scrolling to find out what I learned about this Victorian mansion and see all the pics! Note: This post contains Amazon affiliate links that may pay me commission without affecting the cost. 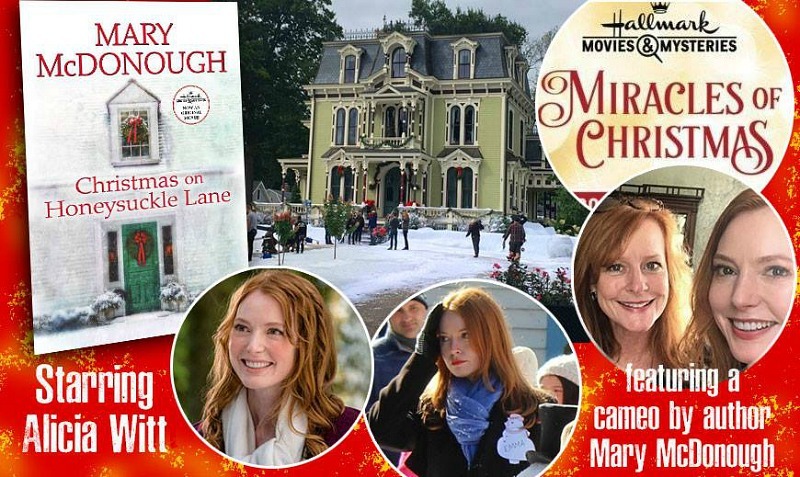 They filmed Christmas on Honeysuckle Lane at the Silas W. Robbins House, a B&B in Wethersfield, Connecticut. 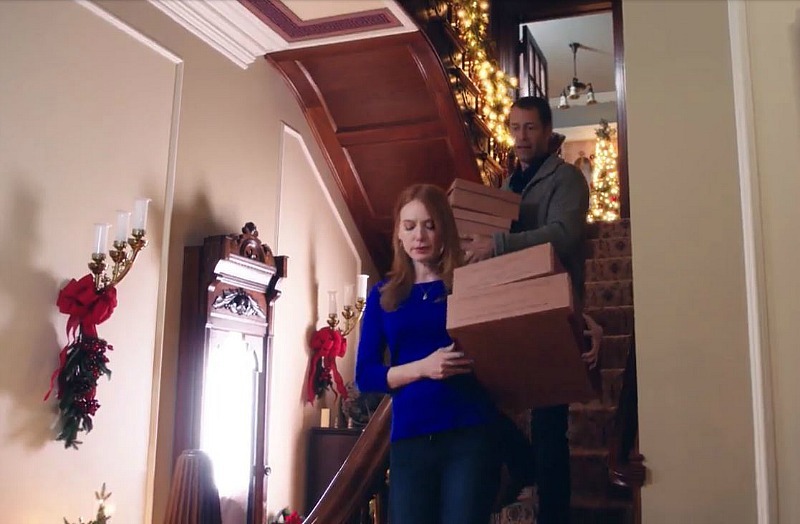 Emma (Alicia Witt) returns home to celebrate Christmas for the last time in the house she grew up in. Since her parents have died (note: I get a point on my BINGO board whenever a movie plot features a dead parent! ), she and her siblings are selling the house on Honeysuckle Lane. Morgan (Colin Ferguson) is hired to appraise the antiques in the house. After they find letters hidden in her mother’s desk, they work together to solve the mystery of who wrote them. McDonough played Erin on The Waltons, and she has a cameo as Emma’s mother in flashbacks here, which is fun. 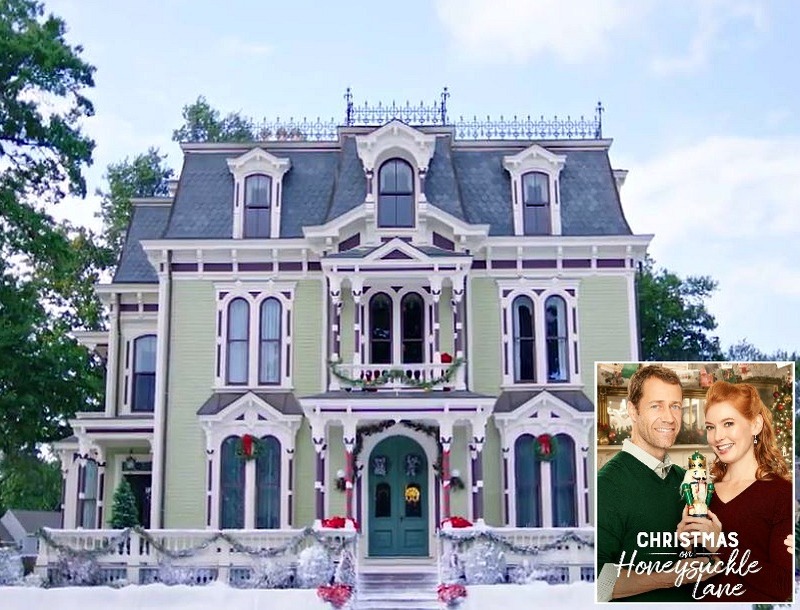 Hallmark Christmas movies almost always have pretty houses in them, but they outdid themselves with this one. The grand double doors alone are awe-inspiring. I was excited to discover the house was on the market recently with plenty of photos. 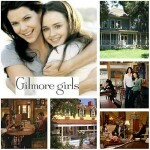 As far as I can tell, they filmed inside the real house instead of separate sets. 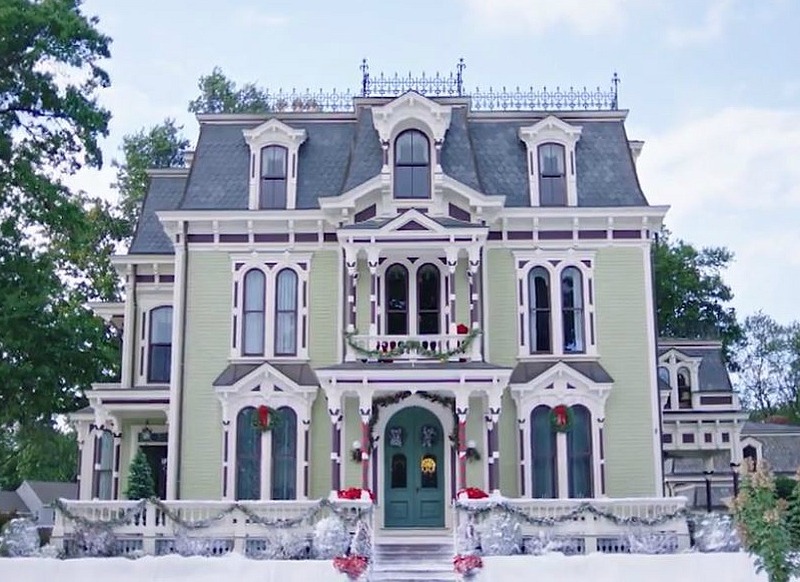 In the movie, the “Christmas attic” for storage is on the third floor, but the listing says there’s a ballroom. This Victorian mansion stands apart as one of the great period homes in Connecticut. Built for the family of a prominent businessman and now operating as a magnificent Bed and Breakfast. In 2001 a masterful 6-year restoration lavishly transformed its 7,500 square feet to create resplendent interiors. In an area known for its historic architecture this masterpiece is an aesthetic tour de force. The listing says the kitchen features a Sub-Zero double fridge, Viking gas stove, Wolf double wall ovens, and two farm sinks. Silas Robbins, owner of the seed business Johnson, Robbins and Co, built the house in 1873. Beautifully restored authentic 19th Century Silas Robbins House, private estate or turn key B&B on gated acre of gracious gardens and manicured lawn in the heart of the Historic District. Architectural history with every detail, impeccable decor, custom milled woodwork and tin ceilings. 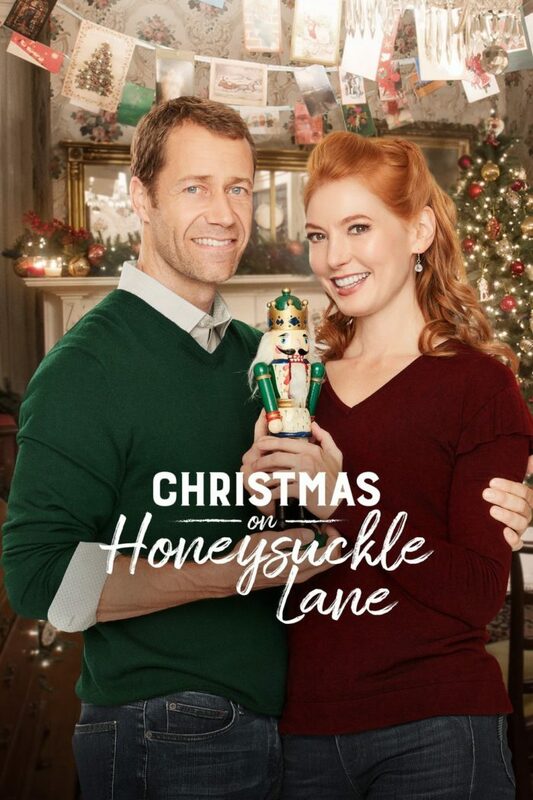 Did anyone else watch Christmas on Honeysuckle Lane and think the house stole the show? They’ll be replaying it throughout the month of December — check the schedule for dates and times. Want to stay there? Visit the Silas W. Robbins website for booking information and the Douglas Elliman listing for more photos.